The use of scanning techniques and x-rays has proven to be very valuable in modern medicine, but for many patients the different types of scans can seem quite confusing and cause many questions to arise. For some, the simple x-ray is enough to allow the doctors to either confirm or rule out their initial thoughts towards a patients diagnosis, for others, the need for other types of medical imaging will be needed in order to gain a more accurate and detailed view of the anatomy. Introduced in the 1970’s, CT scans, or computerised tomography, transformed the way in which doctors were able to achieve diagnose and treat patients.Using highly technical equipment the patient is normally required to lay very still for a few minutes whilst a machine encircles the part of the anatomy required. As it circles the body, radiation is passed through the body and transmitted onto a computer screen where the cross section of the anatomy can be seen. This can give the doctors a clearer image of the exact size, shape and location of any abnormalities and can point out any encroachment of the problem into other areas of the anatomy. Unlike normal x-rays that can only take an image of one plane, a CT scan can gain a much more specific and detailed picture of the anatomy.A CT scan should take no longer than 30 minutes, depending on the location and extent of the anatomy to be imaged. Occasionally a dye may be injected via a peripheral vein in order to allow for clear images of the blood vessels and circulatory system. The dye can be seen on the image and any blockages, narrowing or bulging can be more easily detected. The scan is painless, though some patients may find it uncomfortable to lay still especially if they suffer form mobility problems such as long term back ache. As CT scans require the use of multiple x-ray images, their use is only indicated in the most necessary of cases.Pregnant women should not have a CT scan unless it is for a very urgent reason and those who are concerned about the procedure should discuss their concerns with their GP prior to the scan appointment to prevent an appointment being allocated that may not be taken. 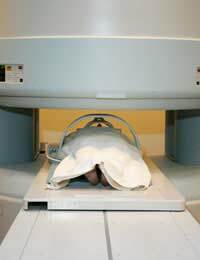 MRI scanning, or magnetic resonance imaging, was developed in the 1980’s and is another major development in modern medicine.Unlike x-rays and CT scans, MRI scanning does not expose the patient to any radiation. Requiring the patient to lie very still on a platform that will eventually be passed into a tunnel, radio waves with an extremely high magnetic field are passed through the body. These waves force the natural positions of the nuclei, found in all cells, in the body to move their position. This movement causes them to send out radio waves of their own, which are detected and interpreted by the scanner and produced as an image, which gives a detailed observation of the inside of the body. Most people find the scan is over quite quickly and does not cause any problems. Those with mobility problems may find it uncomfortable and pain killers should be taken around 30 minutes before the scan to ensure the most comfort is experienced. The scanner can emit a very loud noise whilst it is obtaining the images so many departments offer the use of music whilst the scan is taking place. The scan should take no longer than 45 minutes, depending on the area to be scanned and the patient’s compliance, and due to the use of magnetic waves, no jewellery can be worn and any metal work within the body should be disclosed to staff before the procedure begins. MRI scans are not recommended in early pregnancy, but risks to a more developed foetus seem to be minimal. Medical imaging has advanced enormously over the last few decades and has revolutionised the way in which diseases and illnesses are diagnosed and treated. They removed the need for unnecessary and risky operations to diagnose disorders and provide a much safer environment for the patient, as well as allowing for earlier diagnosis.